“We need to keep a sharp eye out for warbots in this area”. “Atomic batteries, two hundred year lifespan, luckily most of them are so rusty by now you can hear them coming a mile away”. Not the most productive weeks painting this week, I’m sorry to say, but I have at least finished a couple more figures to add to the pile of completed “Wasteland Warriors”. 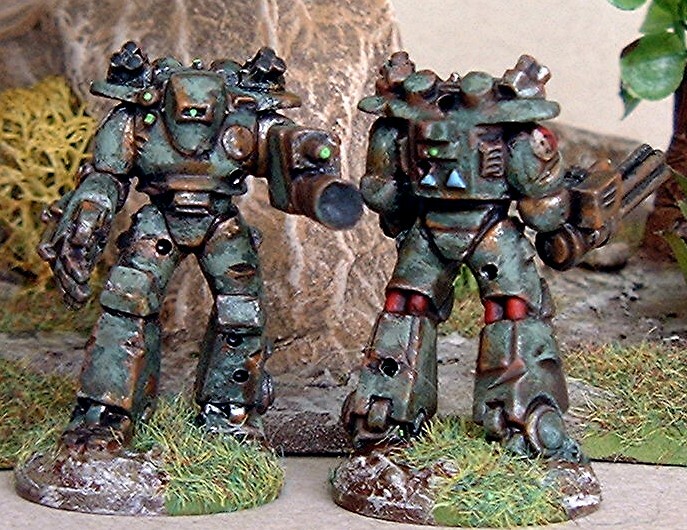 This week I pulled out the couple of “Power Armoured” troopers that I intend to use as old “battle droids” wandering aimlessly about the wasteland battlefields looking for enemies that died years ago, I intend to use these more as a random threat than an actual faction (like the giant mutant rats featured a while ago). Inspired by the fun I had painting the weathered appearance on my “shed” last week I decided to go all out on the weathering on these chaps too. So once the figures were glued together (their arms were separate) I attacked them with my knife, cutting gouges and rents into their bodywork. Next I pulled out my cordless drill and taking a small bit proceeded to add “bullet” holes into their various parts. Once happy with how rough they looked they were mounted onto “tuppences” had the bases filled and were given a coat of matt black. Painting proper was begun with a good dry-brushing with some chainmail and this was followed up by another with rust. Then using an old splayed brush to stipple in areas of deep bronze green around the figures avoiding any edges or areas where I thought the paint would have worn away over time. Once this was dry I mixed some more deep bronze green with some stone green, and used the resultant lighter green to repeat the process slightly inside the edges of these green patches, as if the paint had faded as well. The exposed areas of rust were then given more chainmail highlights along the sharper edges and scratches to represent fresh damage. There are a couple of “pipes” or “pistons” that can be seen at the back of the knee joints so I added these in dark red highlighted with bright red, and while it was out I used this and cream to add the badges on the shoulders with black symbols added to them once dry. After this I took my orange paint and added more fresh “rust” patches here and there. A few dots of day glow green and porcelain blue later and they were ready to be “Quickshaded” with the strong tone version, before their bases were added in my usual fashion. The final obligatory coat of matt varnish finished them off. As I said at the start of this post, not the most numerous weeks painting ever, but at least I am making progress, so till next time, cheers Roger. 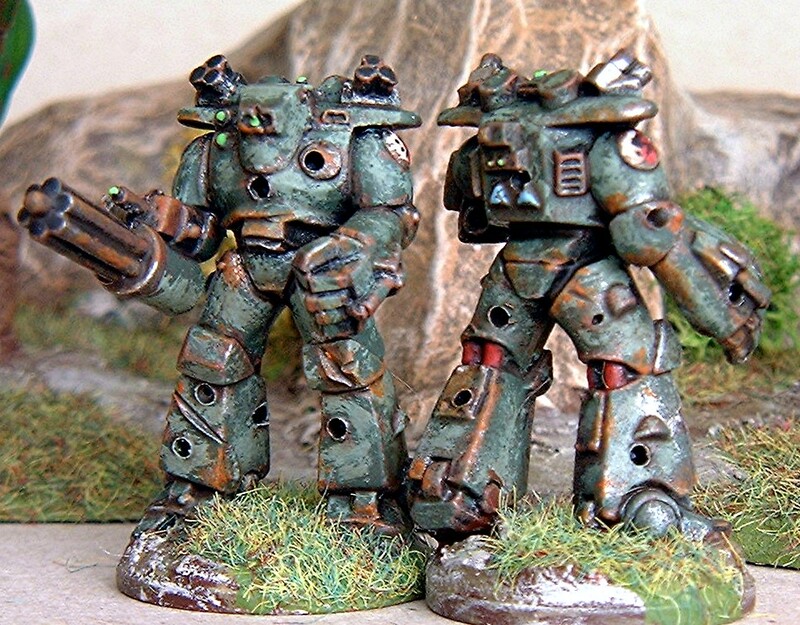 This entry was posted in 28mm sci-fi, Into the Wasteland, sci-fi and tagged 28mm sci-fi, Post apocalypse, sci-fi. Bookmark the permalink. Thanks Dave, you are of course right about the painting progress, I am trying to be good, apart from these “Future Warriors” figures that I was fortunate enough to get via a kind prize from Bryan, I haven’t bought any figures since 2016, so the pile of unpainted lead is slowly shrinking. There is so much that is tempting me though! Oh those are simply outstanding paint-jobs, Roger. Love the weathering effects on them and the battle damage. Marvellous stuff my friend, absolutely marvellous, and I’m not surprised all that work only allowed you to get two minis painted. Many thanks Simon, they didn’t actually didn’t take that long to do, just laziness on my part I’m afraid. Roger, these are absolutely outstanding! 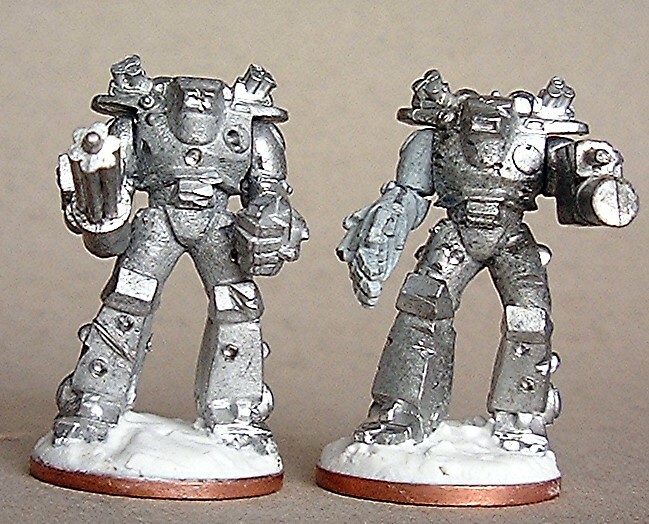 I still have these models, unpainted for far too many years. I just couldn’t decide on a colour scheme for them so they have lain in a box forgotten about. Seeing how well you have converted and painted yours I know where to come looking when I do get round to painting mine. Truly inspired work! Thanks Bryan, most appreciated. I surprised you haven’t painted them up yourself as I would have thought they would look rather good wandering about the streets of Mega-citi one. You’re absolutely right, Roger, which makes it even more shameful that I haven’t painted mine yet. These ar stunning Roger! I just love the weathering that you have achieved. Many thanks Michael, from a man of your artistic prowess I’ll take that compliment with pride. Apologies for not commenting sooner, Roger. Exceptional work on your bots. I do actually own these models, but haven’t quite decided what to do with them yet, so they remain unpainted for now. Just catching up on my blogging, and wow, you know I love Warbots! The weathering, bullet holes, and rents (gauges here in the US) really work. These could wander a battlefield alongside a lost Bolo or two. Kudos Roger! Many thanks Mark, and I am of course well aware of your love of all things “robotic!”. I’m glad you like the beaten up appearance of them, I was inspired by the rusting classic cars you always see out in the desert over on your side of the pond (over here it’s so damp things have fallen apart well before they get that patina on them!! ).